Stacy Tilton Reviews: Get your snack on with Rudolph Pork Rinds for the New Year! Get your snack on with Rudolph Pork Rinds for the New Year! With Christmas behind us that means New Year's Eve is just right around the corner. And that means more time with family and friends celebrating and having a good time. If you're planning to have some people over to celebrate you definitely need to make sure you have plenty of snacks on hand. 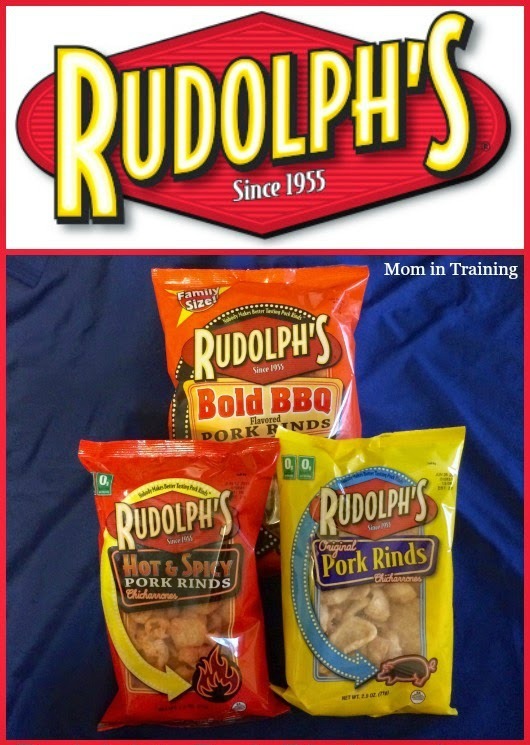 And if you are looking for snack options I encourage you to check out Rudolph’s Pork Rinds. I've always been a fan of pork rinds as a snack, but I don't always want something that's plain. That's why I like Rudolph’s because they have awesome flavors too. I really like their Bold BBQ and my husband likes their Hot & Spicy. There's just something about pork rinds that makes them so much different than a regular potato chip for snacking. Maybe it's the flavor, maybe it's the texture, or maybe it's the way they crunch in your mouth. Any way you look at it they are a hit, and if you serve them to your guests you'll be the hit of the party! About the brand: Rudolph’s Pork Rinds is the world’s largest suppliers of branded, private-label and low carb snack foods, including the world’s largest manufacturer of the best tasting pork rinds. Flavors: Rudolph’s Pork Rinds come in Original, Hot & Spicy, and Bold & Spicy BBQ. Buy it: You can purchase Rudolph’s Pork Rinds online or at your local Walmart.